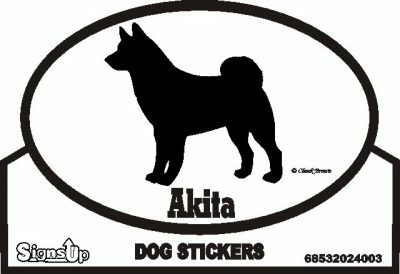 Our euro Akita silhouette bumper stickers are a 3 1/2 x 5 1/2 inch oval with a black and white graphic that displays your dog in a simple yet powerful way. Each sticker is designed for long lasting protection against the elements! You can be sure that our stickers will last a long time. Made by “SignsUp” American manufacturer based out of Fredericksburg, Texas. 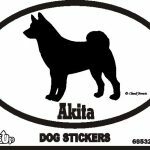 Support an American manufacturer and American retailer DogLoverStore! You won’t be disappointed.